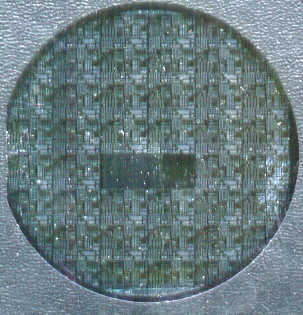 Here are some pictures of an IC wafer I fabricated. The large ones are very large, so be warned! Almost all the devices (pfets, nfets, npn and pnp transitors, resistor chains, capacitors, ring oscillators, etc.) on this wafer worked. The test areas which allow hot-point and four-point probe measurements to be taken at various stages of fabrication are clearly visible in the center; they look like three small squares. In the larger pictures, you can see the University of Illinois symbol in the upper left corner of each die. Circular MOS capacitors are also easy to see, as are the long verticle resistor chains used for electrical determination of the misalignment between layers. If you look around for long enough you'll see that the aluminum forming the top electrode of a few of the capacitors is bubbled and ruptured -- these are the capacitors I destroyed to determine the oxide breakdown strength. Finally, you can see some of the test pads across the wafer used for performance characterization and testing of the circuits and devices after fabrication is complete -- they look like very small, closely packed metal squares. The individual transistors are, of course, not visible -- I'd need a scanner hooked up to a microscope for that! When you look at a wafer like this under a microscope it is actually quite striking looking; much more colorful than it is here and of course, with many more features than are visible here. If you want to test how healthy your heart is, spend an entire semester fabricating an IC wafer in the lab for a course, then in the third last lab drop it into the waste photoresist developer container. I did this -- happily, everything still worked; I just had to redo that lithography step. The other lesson I learned is not to to deposit aluminum in two sub-steps (I had a reason for trying this -- I'm not just a masochist). That truly does horrible things to your metallization, presumably because a small amount of aluminum oxide is able to form in the brief time you pull the wafer out of vacuum. The second batch of aluminum you evaporate onto the wafer will then not bond strongly to the aluminum deposited earlier, and will cause major problems during patterning.